Marmalade, curry powder and green onions join forces for the tastiest chicken salad on the appetizer tray. We popped it in a dinner roll for portability. Mix dressing, marmalade and curry powder in large bowl. Add all remaining ingredients except rolls; mix lightly. Cover. Refrigerate at least 1 hour. Slice tops off dinner rolls. Scoop out centers; discard or reserve for another use. 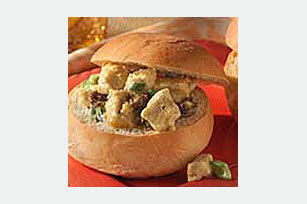 Spoon chicken salad into prepared rolls; cover with tops of rolls. At 12 servings, these mini sandwiches are good to make when entertaining and a welcome addition to any buffet table. Substitute KRAFT Real Mayo Mayonnaise for the MIRACLE WHIP Dressing.